Awarded to the campaign which can demonstrate success in achieving its objectives. The winning campaign can be either internal or external and can combine media including press, radio, television and outdoor advertising. In July this year, a national campaign was launched to raise awareness of kidneys, what they do and why we need to look after them. 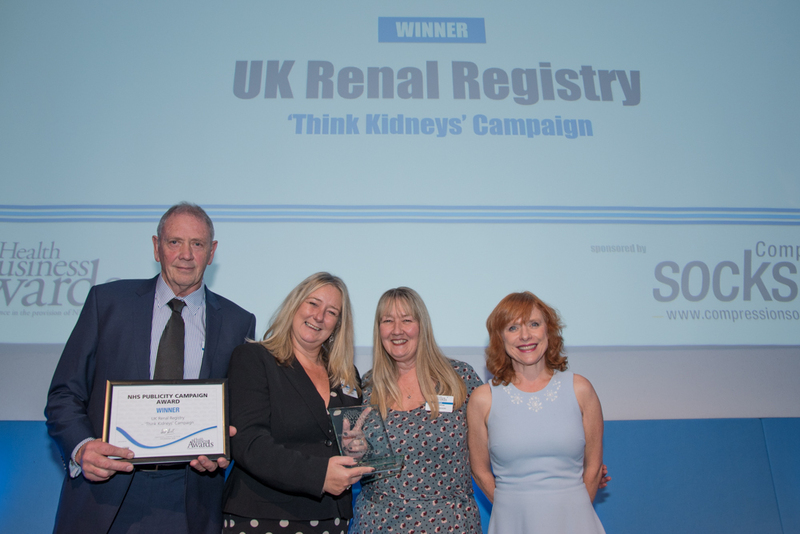 ‘Think Kidneys’, a partnership between NHS England, NHS Improvement and the UK Renal Registry, comprises a website and series of posters, endorsed by the Royal Pharmaceutical Society and displayed by GP surgeries and pharmacies across England. These carry simple messages to explain how kidneys function and tips to keep them working well, such as drinking enough water, as well as signs to look out for which may point to a problem. Dr Sarah Jarvis, Health Business Awards presenter, appeared on the Jeremy Vine radio show to support the campaign. Throughout the 2014/15 winter period, the winning trust delivered a digitally-led internal communications campaign to encourage staff to have the flu vaccinatio, highlighting the reasons why staff must take responsibility for staying healthy during the winter.